Achieve the best cycle lengths, splits, and offsets with PTV Vistro’s signal optimization algorithms. 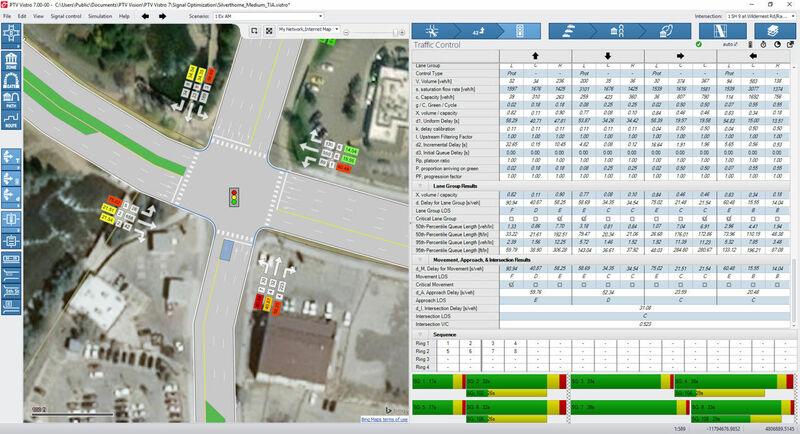 You can easily use the traffic software to optimize signals and test timing plans for a single intersection, an entire network, or a specific route. You can even use PTV Vistro to test impacts of new trips or rerouted trips for detours and events and then optimize the signal corridor for these events. It is the perfect tool for traffic signal operations as it stores historical traffic count data at the intersection as well as a test of signal timing in mitigations. 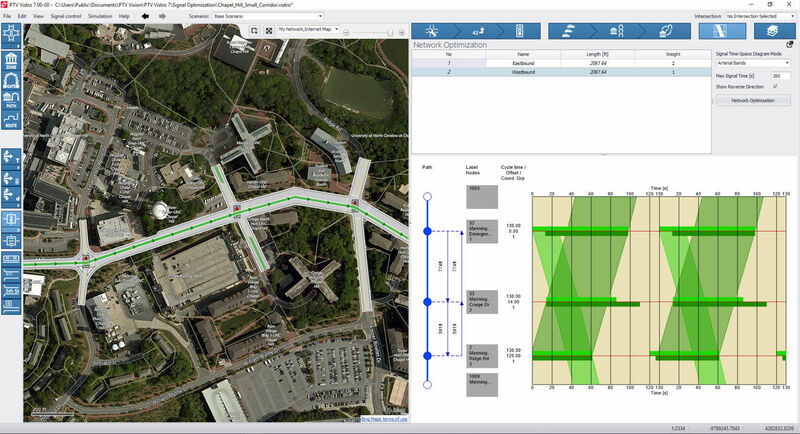 For a single intersection or multiple intersections that are not coordinated with other intersections, PTV Vistro offers local optimization of cycle lengths and splits. In contrast to the local optimization, the network optimization considers the interaction between the signalized intersections. PTV Vistro is unique in that it provides the ability to define specific "routes" for optimization. This means that you have total control over finding the best solution that fits your objectives. PTV Vistro offers instantaneous visual feedback through the signal timing diagram showing the green, amber, and all red times for each movement at a specific intersection. It also provides a powerful output through the optimization results graph, details about the optimization process, and visual representation of the output through a time-space diagram.